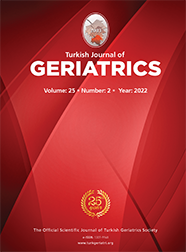 2Hacettepe University, Faculty of Economics and Administrative Sciences, Department of Family and Consumer Sciences DOI : 10.31086/tjgeri.2018137961 Introduction: The participants in this study, which was conducted to evaluate abuse and neglect in the elderly using the Hwalek?Sengstock Elder Abuse Screening Test, comprised older adults aged 65 and over, residing in Etimesgut, Ankara. Materials and Method: The study employed the Hwalek?Sengstock Elder Abuse Screening Test as the data collection instrument. In addition to standard deviation and arithmetic mean, the t-test was used for data comparisons between two groups, and analysis of variance was conducted when analyzing more than two groups. Results: The abuse and neglect status of the participants displayed significant differences with respect to educational attainment, monthly income, number of children, other household members, ownership of residence, and social security (p < 0.05).